LOS VACIOS URBANOS _ Clara Nubiola: CROSS SECTIONS · Jonathan Mess. 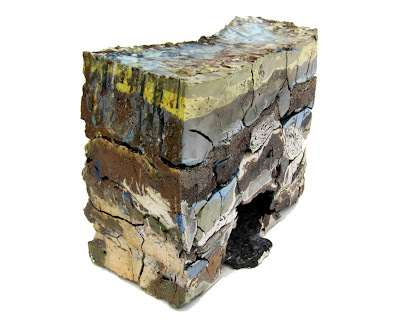 CROSS SECTIONS · Jonathan Mess. Prometo que cuando recupere a mi cabeza profundizo. Tengo pendiente un post bomba sobre la conferencia del otro día. 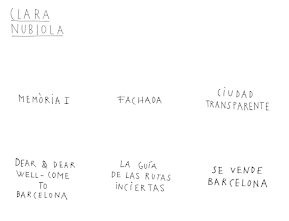 La que hablaba de turismo y ciudades souvenir. Pero necesito a la cabeza despejada. Retiro lo de post bomba. Que luego vienen las expectativas. Mientras, me he encontrado a estas rocas coloristas. No soy mucho de colorismos ondulantes. Pero igual he pensado en mi cabeza. Sea lo que sea, aquí están. Él cuenta muchas cosas y hay palabras como landfills, nature, nature, time, geologic, así que muy de aquí, de la casa. Bienvenido a los vacíos urbanos. "Cross Sections is a body of sculptures that respond to Landfills, another series of sculptures that I created in 2008. Both reflect my interest in the physicality of land affected by time, the elements and human manipulation. 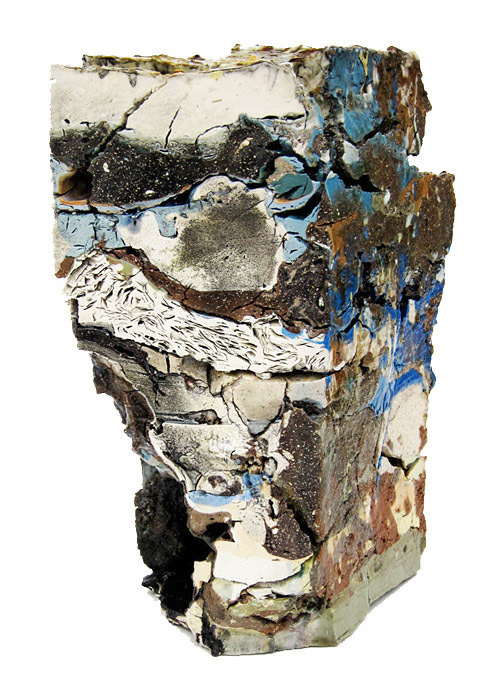 Clay is an essential material in my process because it literally allows me to use the earth’s crust as my medium. 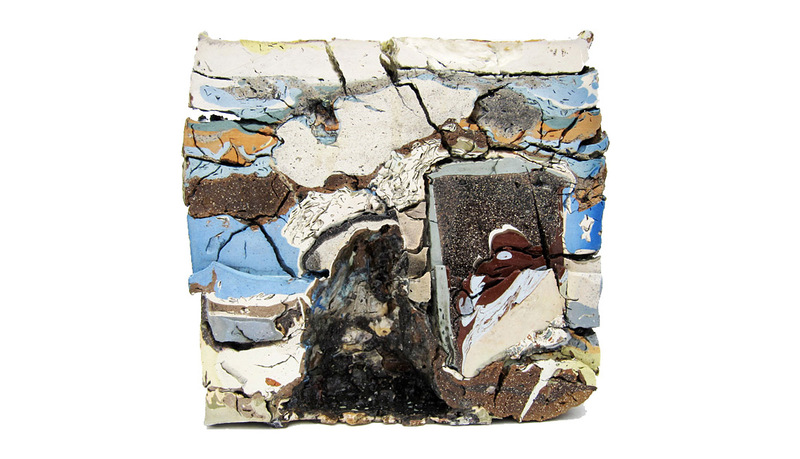 The recycling of ceramic materials—slop clay and cast-aside glazes, once-fired, unused, forgotten, discarded, cut-up, and broken work—is inherent to the development of this work. 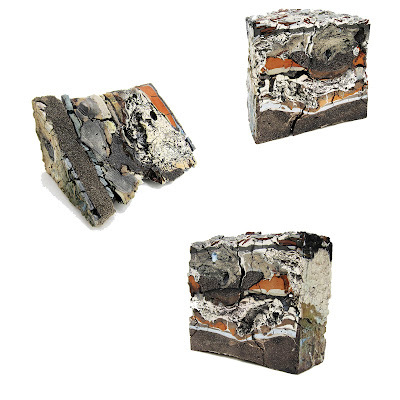 To create the Landfill series, I engineered and incorporated a low-waste system of making by using recycled clays and even mixing the clay that falls to the floor back into my system. I slowly poured layer upon layer of pre-colored casting slip into found cardboard boxes in various thicknesses, wetnesses and consistencies, adding recycled clay, slop clay, old glazes and leftover ceramic materials into the mix. 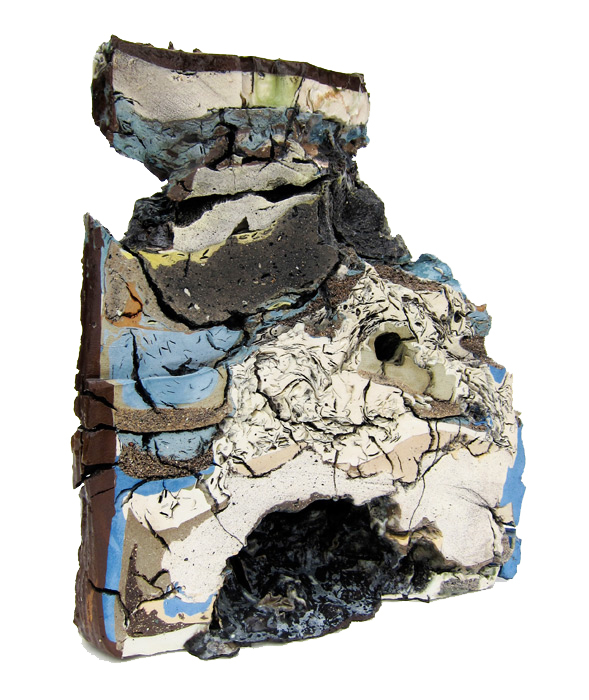 The combination created a wasteland form of refuse resembling geologic layers of time. In my eyes, the forms became land and the layering of clay directly related to geology. The cardboard box became a divider of rectangular land parcels, or grids. Time, along with directional wind from fans, created both controlled and uncontrolled shrinkage, cracking and bloating in theseLandfills. Playing nature, I found I could control elements to achieve different geologic effects".